In 2000 the idea came while sitting outside my tent in Maçon, north of Lyon. i was reading David Toop's Ocean of Sound. It was late evening and very warn, suddenly, crickets began that scratching, clicking sound. The noise alone seemed to raise the temperature by about 5℃. I associated the sound with sun-baked spaghetti westerns and 50's melodramas set in the deep south. When i was a kid, i thought ice cream smelt of diesel fumes. I worked it out years later, you queue for your ice cream by the exhaust pipe of the van. Smells and sounds can be as evocative as images. 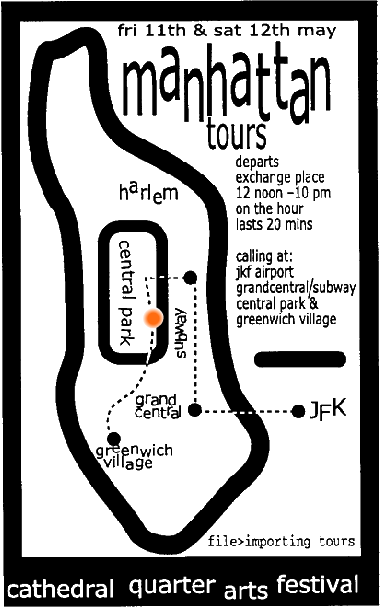 Later in 2001 I travelled to the USA for the first time, Manhattan. 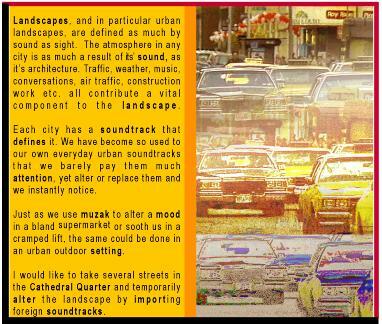 I knew what new york looked like but had no idea what it sounded like. Before the trip i went into the library and borrowed a BBC sound-fx of NY. The sounds were 3 mins, like snap shots. It might be interesting to make sonic snap shots of the trip and show it to people as you would a photo album. 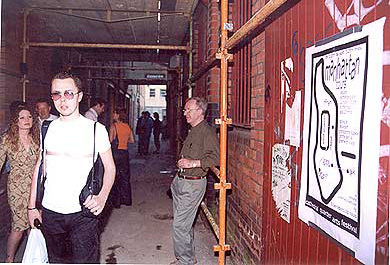 In early 2002 I contacted Seán Kelly, Director at CQAF, to see if he'd be interested in using it in the festival. It was only their second festival and they were still very small and probably willing to take a risk. I sent him the proposal. He was keen or perhaps desperate, the budget was tiny - £200. 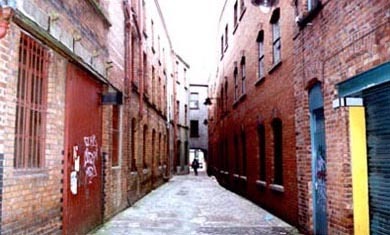 the 'Cathedral Quarter' is a small inner city area of Belfast, once associated with the print trade. It's largely pedestrianised, cobbled and with some atmospheric old streets. It's quite popular now but back then it was still considered 'out of town'. Exchange place, off Donegal St. seemed ideal. There aren't too many people working there, it had an art gallery/workspace in a second floor warehouse, Catalyst Arts. Stephen and John at Catalyst kindly loaned me their toilet as a control base. I would be able to set the tape recorders on the toilet bowl and cistern and feed all necessary wiring out the window. I spent many evenings in a scrap yard in Hannastown, West Belfast, ripping old car speakers from Vauxhall cars. Vauxhall use Blaupunkt speakers - quality. I ended up with about 30. I borrowed 4 amplifiers to drive each set of speakers. I used cheap wire to make the connections. Cheap wire was probably the weakest link - don't skimp on the conductors. 4 tape recorders were used (before iPods). 4 tapes were colour coded. The speakers were colour coded. Sounds (events) were allocated a colour. Colour indicated which speaker it came from. All events were placed on a timeline, eg at 6 min you pass subway turn style on yellow , 30 secs later the train arrives on red . The mix gave a feeling of space and narrative. Speakers did not output at all times but alternated throughout the piece, giving a 3d, surround effect. The piece took place in a 30 metre artificial tunnel construced of scaffolding. The map was used as a flyer and large poster to advertise the event. The orange blob shows the imaginary route taken. The event actually took 20 mins. The plane landing at JFK. The taxi ride to manhattan. Walking to grand central station. Going down to the subway. The train pulling up. Riding inside the train and traveling up town. Walking through central park. Stopping at a diner for something to eat. Heading on to a party in Greenwich Village. An argument. the cops arriving to make an arrest. Jetting home again. A whirlwind trip in 20 mins. The event was advertised as '2 days in Manhattan absolutely free' - who wouldn't want two days in Manhattan… absolutely free!. It took place on the last Fri and Sat of the festival. Most of the 100's who attended were dragged down the entry by the strange noises but lots came with flyer in hand promptly on the hour for their "tour". I followed this up with several other 'installations' over the years.